Stress management hypnosis is probably one of the least understood stress management techniques. Hypnosis for stress management won't have you clucking like a chicken or barking like a dog. Instead hypnosis can be a valuable tool to manage stress and anxiety, control and manage chronic pain, and overcome fears in your life. Hypnosis allows you to enter a deep state of relaxation and focus your mind on the issue at hand. From this point of view stress management hypnosis can help in two ways. Hypnosis for stress management allows you to get into a deeply relaxed state. Stress management hypnosis can enable you to make lifestyle changes that reduce stress. If this sounds like something that interests you then download instant stress relief and wash away your built-up stress today. 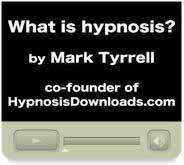 If you want to see how hypnosis works for stress then Mark Tyrrell explains how hypnosis works for you. Stress is a part of life but it does not have to be a way of life! When stressed your body activates the fight or flight response and results in a number of signs of stress. While this stress response serves and important function often this response can be activated constantly by daily hassles and various causes of stress. stress and high blood pressure. For example, by inducing the person into a deep state of relaxation the body activates the relaxation response. This is the direct opposite of the stress response and helps to counter the emotional and physical effects of stress. You can download instant stress relief and wash away your built-up stress today. Hypnosis for stress relief also enables you to achieve lifestyle changes that can reduce the amount of stress you can feel. For example, hypnosis can help you stick with an exercise program. There is a long line of research to show that exercise reduces stress. On the other hand there are a number of unhealthy coping skills that can come with increased stress. Do you smoke more when stressed? Do you find that you drink more caffeine when stressed or need alcohol to relax after a hard day? Some unhealthy coping skills for dealing with stress can actually cause more stress. At the same time, hypnosis for stress management enables you to become more assertive and set clear boundaries...both factors that can reduce stress levels. So there are a number of avenues that self hypnosis for stress can affect the stress you feel in your life. This versatile tool can be for many things from pain and stress reduction to stopping smoking. There are a number of other techniques that can help to reduce stress. this structured problem solving technique to identify ways to reduce the stressful situation. reducing stress through a fun and effective stress management activity. Hypnosis assumes that the patient has inner resources to deal with change and that hypnosis can enable you to find these resources. The task of the hypnotherapist is to facilitate this process. Similarly it is important for the individual to practice self hypnosis between sessions. Hypnosis does not work for all people. Some people can't find the time or the focus, or are not hypnotizable.